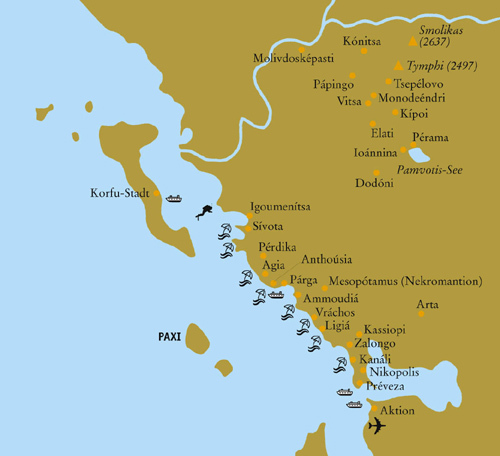 This part of Greece hosts dozens of large and small mountains, notably the Pindus range. The mountains give the impression that they are rising up out of the Ionian Sea. Forests, wild vegetation, lagoons, rivers and wetlands provide sanctuary to thousands of birds. Fabulous beaches and unforgettable verdant shores bathed in sunlight are washed by the turquoise Ionian. Here in Epirus, life flows as quietly as the rivers. Here life is filled with the songs of the migratory birds and whispering of the leaves. Here the soul is resurrected in some picturesque village, some magical town. VIKOS-GORGE - NATIONAL PARK: Numerous species of mammals such as bears, foxes and deer, fish and birds could be found in the park. The forests are composed of diverse species of flora. DODONI: In Epirus it was the second oracle of ancient Greece after Delphi. Its temple was dedicated to Zeus. The nearby theatre was one of the largest of antiquity. Several other ruins bear testament to the importance of the site. NEKROMANTION: On the hill above the site where the rivers Acheron and Kokkytos converge, near the modern village of Messopotamos , lies the most important ancient necromantic oracle, Nekromantion . The existence of a rock with a cave in the confluence of the rivers made the site ideal for the erection of the holy monument, dating back to 5 th cent. B.C. Ancient Greeks believed it to be the location of the Gates of the Underworld, the Kingdom of Hades , the much-feared God of the Dead, and went there to offer libations to the dead in order to communicate with their souls and get information. ZALONGO: Zalongo is famous for the Hill of Zalongo where Souliotes women decided to die and not to be slaves of Ali Pasha, throwing their children down the hill, dancing, singing, and then jumping to death. KASSOPI: This early 4th century BC city surrounded by a polygonal wall, was burned by the Romans in 167BC and abandoned when Nikopolis was founded, the citizens commanded to relocate there in 31BC. IOANNINA: The town is built on the shores of Lake Pamvotida. It is the largest and prettiest city in Epirus, with old buildings, narrow streets and natural charms. The area around the town has many attractions such as the village of Perama with the famous cave, Mouzakei with the wax museum, the island in the lake Pamvotida. PARGA: Idyllic town, which has plenty of water to irrigate its fertile and verdant land.